World-Renowned Singer, Songwriter Mohsen Namjoo comes Center Stage with Mark Gordon. 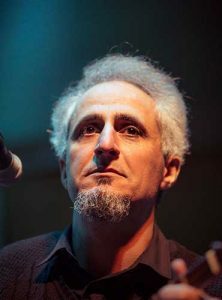 Mohsen Namjoo is an Iranian composer, singer, and songwriter. His unique music style resembles a patchwork of Iranian blues, rock, and folk. His song lyrics are a unique combination of classical Persian poems, his authentic compositions, and contemporary poetry, using words freely, with irony and sarcasm to accompany the music and create an open vocal style. Namjoo was born in 1976 in Torbat-e Jam, a small town in northeastern Iran. Between the end of 1997 and beginning of 1998, Namjoo holds his first two concerts on the theme “Modern Combination of Poetry and Music of Iran.” His debut album “Toranj” was officially published in Iran in 2007. Namjoo has also composed soundtracks for film and theater. Since his arrival to the U.S. in 2011, Namjoo has been touring the world to sold out concerts at prestigious halls such as Palace of Fine Arts, San Francisco; Conservatorio Sala Verdi, Milan, Italy; Disney Hall and Royce Hall, Los Angeles and many more. His latest album ON THE STRING OF THE TEAR’S BOW was released earlier this spring.